Through the USAID Oceans Technical Working Group, national government partners, and regional project implementing partners will identify prospective expansion sites within the other ASEAN nations (Expansion Sites II), which include Brunei, Cambodia, Laos, Myanmar, Vietnam, and the CTI-CFF participating nations of Timor-Leste, Papua New Guinea, and the Solomon Islands. Coastal Area: 435 kilometers of coastline and an Economic Zone (EEZ) covering 55,600 square kilometers. Main Fishing Sites: Cambodia’s freshwater fisheries are among the most productive in the world due to the presence of large floodplains around the Great Lake and along the Tonle Sap and the Mekong Rivers. Sihanoukville and Koh Kong are the most productive landing sites. Fisheries Production: Cambodia’s inland fisheries production totals 570,000 tons and marine fisheries production totals 120,000 tons, which comprises 19 to 25 percent of the yearly total. Aquaculture production is calculated to be 71,610 tons/year. 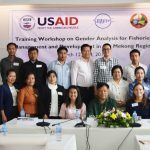 Current Traceability Initiatives: Catch documentation is limited in Cambodia, with the Fisheries Administration being challenged by fish being sold at sea without transmission of catch records. 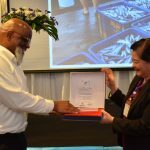 Fisheries Production: Annual potential yield of about 21,300 million tons with the value of US $112 million, comprises three sectors: capture fisheries, aquaculture, and seafood processing sector. Capture fisheries in Brunei Darussalam are derived from small-scale (70%) and commercial fisheries sectors. About 30% of the total production is contributed by the commercial fisheries sector that comprise the trawlers, purse seiners and long liners. 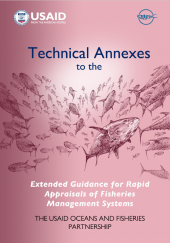 Current Traceability Initiatives: Brunei is challenged by an increasing number of fishers, declining fish stocks, and unsustainable utilization of its fisheries resources. 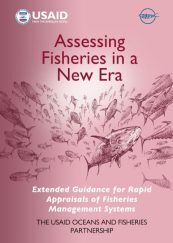 In Brunei, fisheries are governed by Fisheries Order 2009 and Brunei Fishery Limit Act Chapter 130 and the National Plan of Action to prevent, deter and eliminate IUU fishing. Main Fishing Sites: Fisheries consist mainly small local landing sites along the Mekong River, reservoirs and lakes, with five major landing ports, including those at Namngum and Namtuen reservoir. There are no commercial fisheries. Import and Export Trends: Lao PDR imports mainly seafood, such as tilapia, from its neighbor countries. 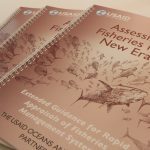 Current Traceability Initiatives: For Lao PDR, IUU fishing continues to be a challenge, as does the lack of a traceability system. There is no catch documentation; the only information recorded is the amount of the sale at the landing sites. Import and Export Trends: Myanmar imports 382.54 tons of fisheries products, valued at USD 0.06 million. Myanmar exports 0.3383 million tons, valued at USD 482.252 million. Number of Vessels: In Myanmar, the predominant vessel type(s) are offshore fishery trawlers. Myanmar has 3030 offshore fishing vessels. Current Traceability Initiatives: At present, Myanmar’s catch documentation and traceability system is largely paper based. Myanmar is challenged by illegal, unreported, and unregulated fishing, and in particular with unlicensed fishing, duplicate vessel registrations, deployment of non-conforming gear, encroaching on inshore waters or protected areas, and incursions of foreign unlicensed fishing vessels into Myanmar waters. Import and Export Trends: There is no commercial scale fishing in Singapore. Singapore is primarily an importer of catfish, mackerel, salmon, scad and tuna from Indonesia, Vietnam, Malaysia, Thailand, and Norway. Singapore exports tuna, swordfish, shark, marlin and catfish to Vietnam, Malaysia, Japan, Taiwan and Indonesia. 90 percent of Singapore’s tuna imports are processed and exports. Number of Vessels: Singapore’s fisheries are quite small, consisting of four small-scale vessels and 26 traditional/subsistence fishing vessels. Coastal Area: Vietnam’s coastline extends 3,260 km and its EEZ is approximately 1 million square kilometers. Import and Export Trends: In 2015, Vietnam’s total export value USD 6.68 billion and the total import value is over USD 1 billion. Number of Vessels: Small vessels comprise about 71 percent and larger vessels about 29 percent of the fishing industry in Vietnam. Current Traceability Initiatives: Vietnam’s catch documentation system is mainly paper based up to the point of the processor, who uses electronic documentation. Challenges for implementing an electronic CDT system in Vietnam include the prevalence of small scale fisheries, low awareness of the need for CDT on the part of fishers and limited application of IT for CDT. The Coral Triangle Initiative on Coral Reefs, Fisheries, and Food Security (CTI-CFF) is a multilateral partnership of six countries working together to sustain extraordinary marine and coastal resources by addressing crucial issues such as food security, climate change and marine biodiversity. In addition to Indonesia, Malaysia, and the Philippines Papua New Guinea, Timor Leste and Solomon Islands are partners to CTI-CFF.